This article was written by Rebekah Brannan as part of the Breening Thursdays series. In 1992, Disney studios released the third Disney Princess film of the Disney Renaissance Era. 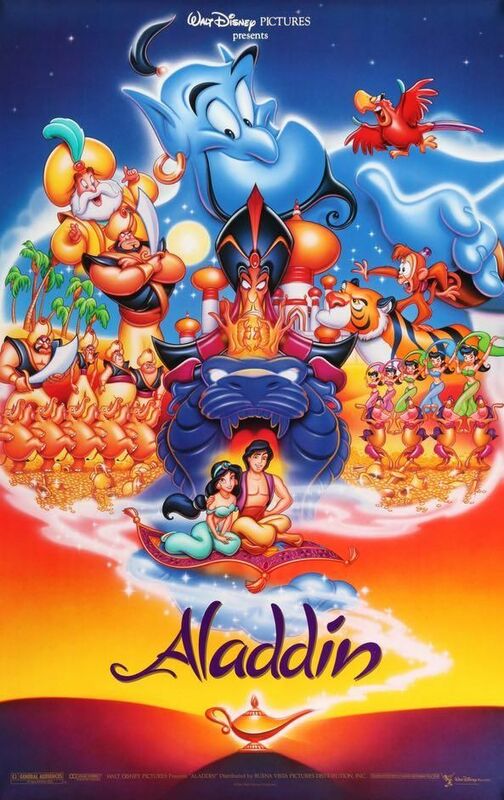 This film is Aladdin. This film’s exotic locale sets the scene for a story that has everything, from a beautiful princess to a dashing market thief to an evil sorcerer to a comedic genie to a lovable monkey. However, when watching this film and taking notes, I found that it had the largest number of objections found in a Disney film so far, since a whopping fifty-one elements, lines, scenarios, and costumes were unacceptable in this film. While, once again, this film is a beloved family classic and an overall enjoyable movie, we must be warned to the dangers it holds so it cannot do harm to the immature minds of people watching it. The romance is genuine and sweet, the darker scenes are just dramatic and intense enough to be effective, and most of the humor is funny and charming. 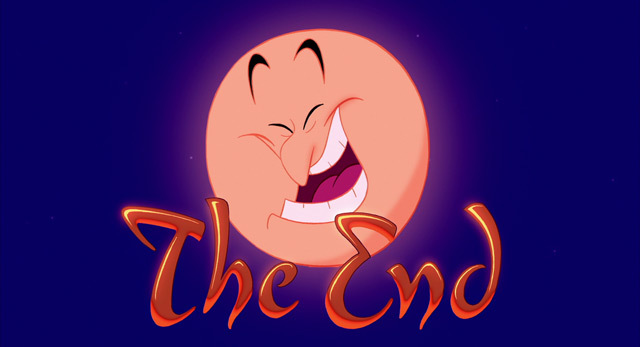 However, there are quite a few vulgar jokes, mostly within songs and the Genie’s dialogue. So, today I am going to show how this film could have been made entirely acceptable for every member of the family, and no one could possibly be offended. Now, the lights dim, the theater hushes, and the screen comes to life. Get ready for a some breening, because here comes Aladdin! At the opening of the film, a salesman is trying to sell several objects to the audience. Among these is a piece of Dead Sea Tupperware. To see if it’s still good, he opens one edge of it and makes a raspberry sound. This is vulgar, and raspberries are forbidden, so it must be eliminated. 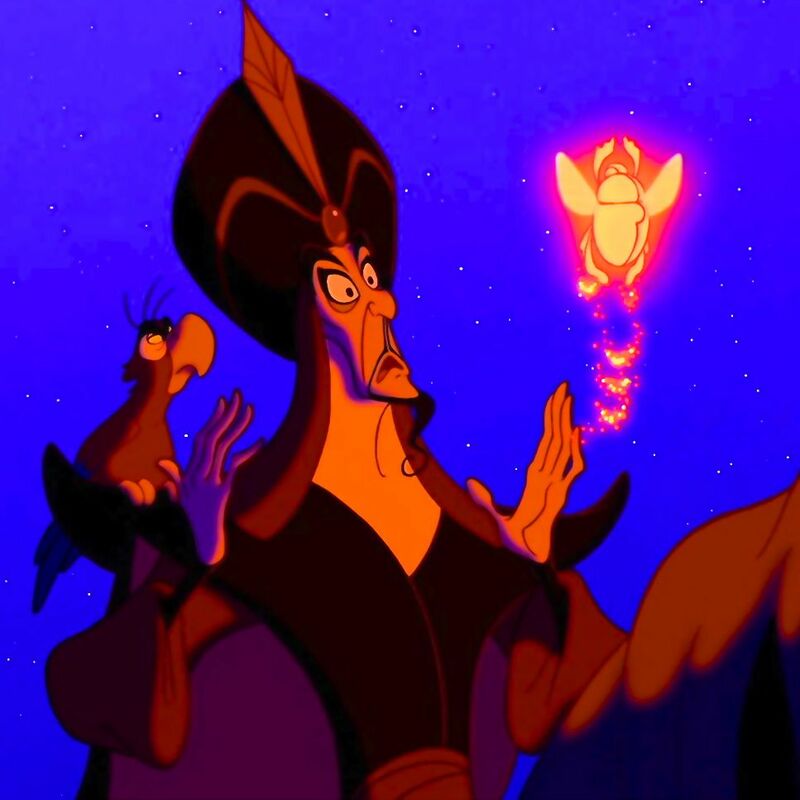 In this same scene, Jafar’s parrot, Iago, uses the exclamation, “Jeez!” This is a forbidden expression and must be changed to “Gee,” or some other acceptable exclamation. 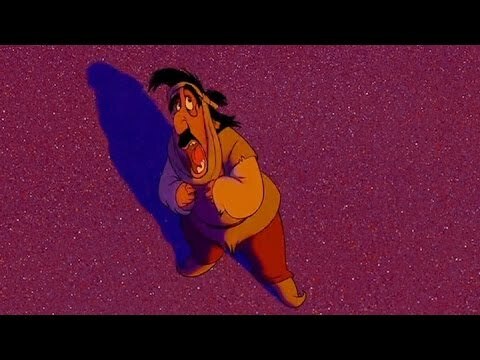 In the next scene, when Aladdin is running away from guards, he jumps onto a clothesline, strewing clothes everywhere in the process. Among these clothes is a woman’s brassiere. Intimate women’s undergarments should not be shown, so this must be eliminated. During the next song, “One Jump Ahead,” Abu does a raspberry at one of the guards. This must be eliminated. 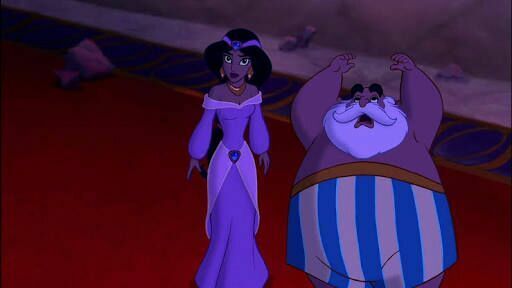 During the same song, Aladdin pulls off a guard’s sash, causing his pants to fall down. This is vulgar and must be eliminated. 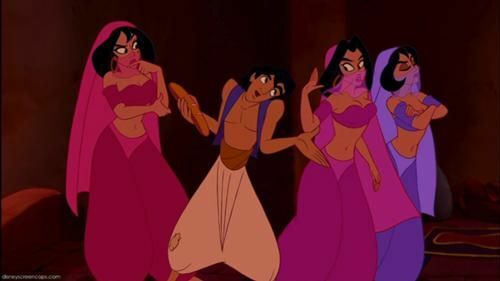 Later in the song, when Aladdin tells the guards that the loaf of bread he stole is just a snack, they sing, “Rip him open; take it back, guys.” This is violent as well as ridiculous, since he has not eaten the bread yet; it must be changed. Perhaps the lyric could be changed to, “Catch that thief and take it back, guys.” Of course, this decision is really up to the lyricist. 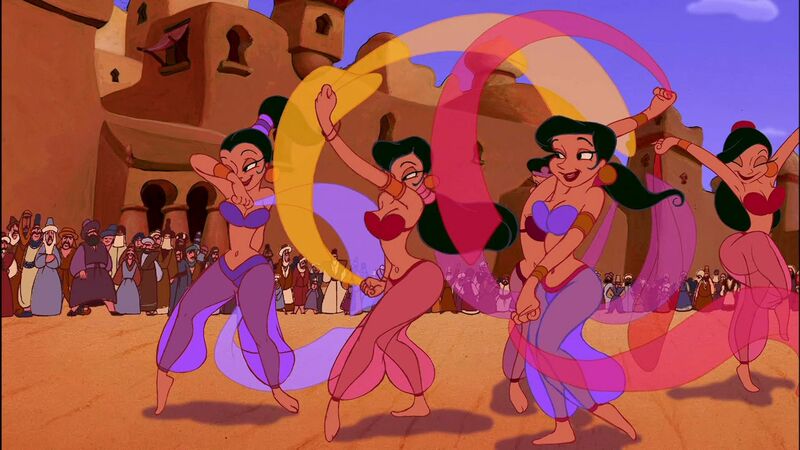 A little later in the song, Aladdin jumps through a window into a room with three belly-dancers in it. They are wearing skimpy bra-tops that show too much of their chests and low-cut harem pants that show their navels. The waistline of the pants must be brought up, and the tops must be fully covering. 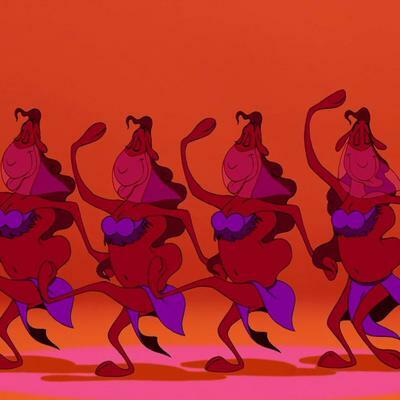 The three belly-dancers sing a lyric which goes, “Oh, it’s sad, Aladdin’s hit the bottom.” The lyric itself is alright, but they accompany the word “bottom” by moving their hips and posteriors quite suggestively. This must be eliminated. 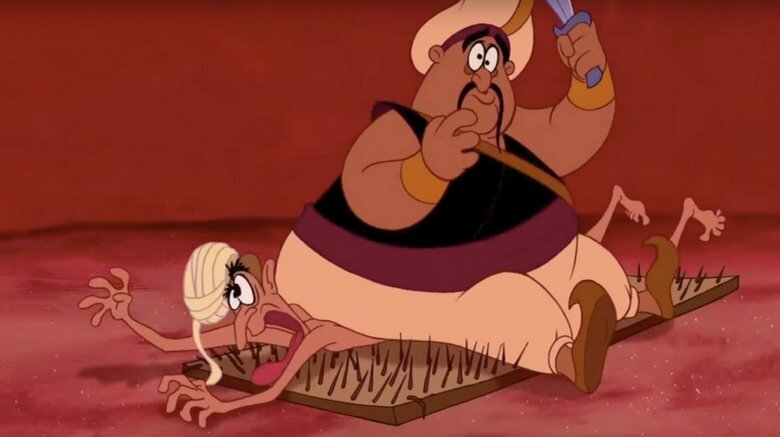 Later in the song, the guards chase Aladdin past a man in a loincloth lying on a bed of nails. The man is wearing far too few clothes and must at least be wearing pants. As they chase Aladdin past this man, the last guard in line falls on him and smashes him down onto the nails. This is violent and must be removed. Aladdin casually leans on a couple of the guards’ shoulders, then jumps out of the way just as they try to pounce on him. When the dust clears, several of the guards seem to have their throats right above some of the other guards’ swords. They are choking slightly, as though their throats have been cut. This is violent and must be eliminated. They may jump on each other, but their swords should be entirely clear of each other’s throats. Later in the song, Abu encounters a man swallowing a sword and pulls it out to frighten the guards. The man chokes and puts his hand to his throat as though Abu has cut it. This is very violent and must be changed. Abu should grab a sword from someone’s belt, a stall of weapons, etc. At the end of the song, the guards jump out of a window and land in a cart of “Crazy Hakim’s Fertilizer.” This is rather vulgar and should be changed. They should land in a pile of mud, laundry, or something else acceptable that would break their fall. 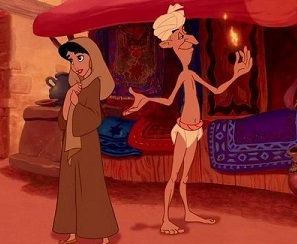 Later in the scene, a rude prince named Achmed insults Aladdin, so Aladdin jokingly says to Abu, “Look at that, Abu. It’s not every day you see a horse with two rear-ends.” This is quite vulgar, as is the shot of the horse’s rather prominent posterior; both the line and the shot should be eliminated. Later, Achmed is seen storming out of the palace. Princess Jasmine’s tiger, Rajah, has bitten a hole in the seat of his pants so that his white and red heart-print shorts are visible. A piece of the shorts is also found in Rajah’s mouth. This scenario is quite vulgar and must be changed. Prince Achmed’s pant leg or his coat may be torn, but he must not have a bite taken out of the seat of his pants. 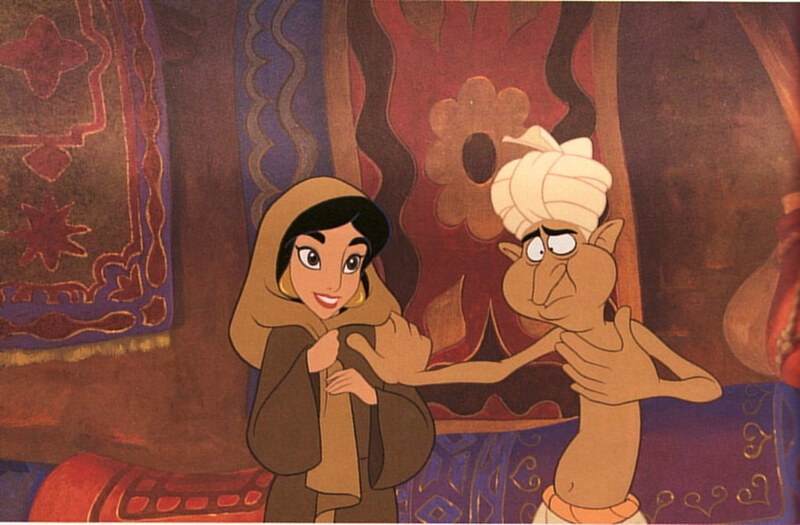 We then see Jasmine for the first time, and an ongoing problem that lasts for the rest of the film is first seen. 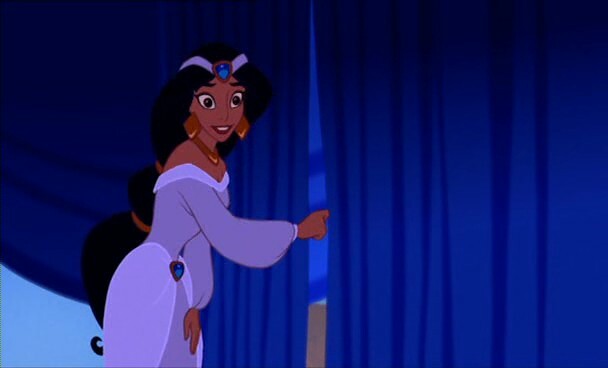 Jasmine is depicted for most of the movie wearing a very revealing belly-dancer costume. Regularly, I would merely say that her chest and navel must be covered and leave it at that. However, the problem goes farther than that. This film gives the impression that Arabic princesses run about in belly-dancer costumes, but belly-dancing is considered haram (sinful) in Arabia. In real life, Arabian women wear long dresses, gloves, head-coverings, and even face-coverings. This movie made a generation of people grow up thinking this is the sort of clothing Arabic princesses wear. This is insulting to Arabic people, who pride themselves for their modesty, and is entirely unacceptable. 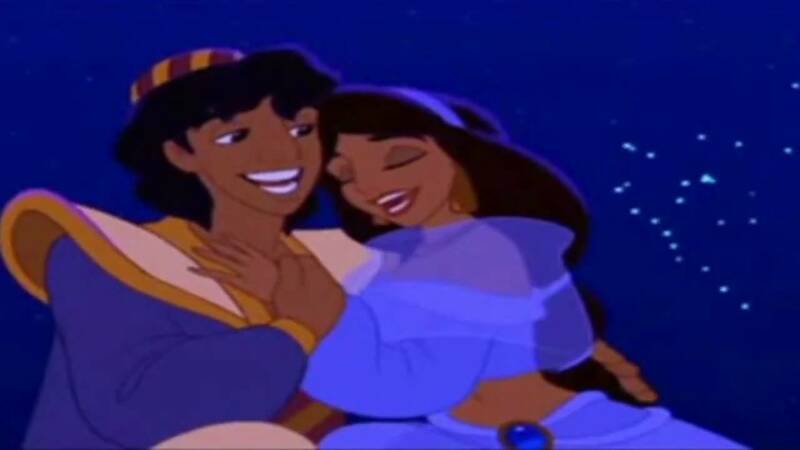 It is not necessary that Jasmine’s face be covered, but she should wear an outfit that is realistic of Arabic royalty at the time the story takes place. Then, when she goes out in the street, she changes into the brown outfit seen in the movie so that she will look like a commoner. Her second outfit is better, but it should cover her shoulders and chest sufficiently, and she should wear some sort of head covering. Her final outfit, only seen at the very end, once again shows her midriff and must be more covering. Later, when Jasmine’s father is lecturing her about her reluctance to choose a suitor, he uses the exclamation, “Allah forbid.” This is once again taking the Muslim god’s name in vain and must be changed. “Heaven forbid” will be entirely sufficient. Later, when Jasmine goes out into the marketplace, she bumps into a fire-swallower who is wearing nothing more than a loincloth. He must at least be wearing pants. When Jasmine bumps into this fire-swallower, she accidentally makes him literally swallow the torch in his hand. He reacts for a moment, then burps and taps his chest contentedly This entire scenario is unacceptable and should be eliminated. Later, when Aladdin is in the dungeon, Jafar appears, disguised as an old prisoner. In his disguise he has positively grotesque teeth, and he opens his mouth far wider than is humanly possible so that we can see all of them. His teeth must not be so grotesque, and he should not open his mouth so wide when he grins evilly. Later, when Jafar’s trickery causes Aladdin to get trapped in the Cave of Wonders, he calls him a “son of a jackal.” This is a variation on a form of swearing and must be eliminated. He should instead call him a rat, a skunk, or some other acceptable name. Later, during the Genie’s big song, “Friend Like Me,” the Genie’s tongue turns into a staircase, and a smaller version of himself walks down it. This is vulgar and must be eliminated. Later in the song, Genie fabricates three harem girls in very revealing tops and skimpy, transparent skirts with very small bikini bottoms under them. Like the other harem girls, they must be wearing covering tops and opaque skirts. These same harem girls, whom we see twice, do too much isolated hip movement. This must be toned down. 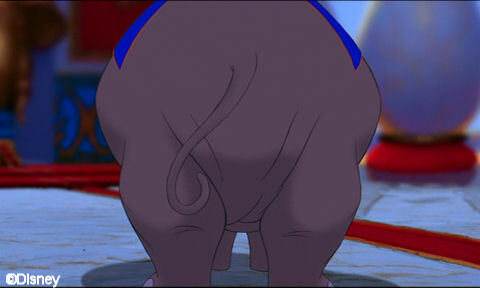 Later in the song, the Genie rubs a ribbon against his posterior, then turns his back to the camera. His posterior becomes enlarged, taking up most of the screen. This entire scenario is completely unacceptable and must be removed. 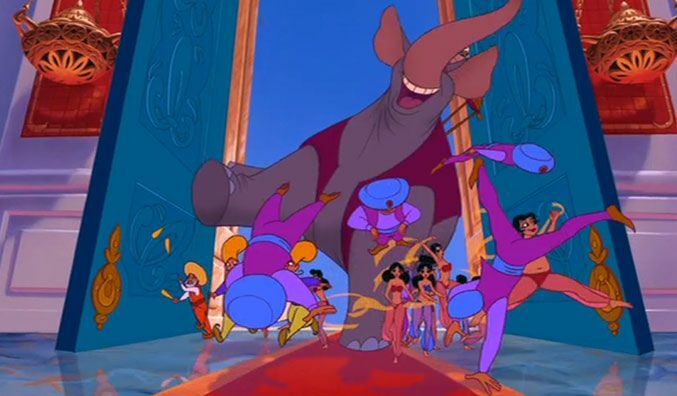 At the end of the song, Genie fabricates several creatures, including a group of camels dressed in belly-dancer costumes. This seems rather vulgar and should be removed. 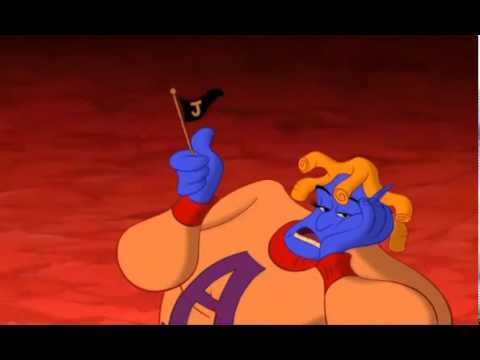 After the song, when Genie is telling Aladdin the three rules of wishes, he says that the first is that he can’t kill anyone. As he says this, he chops off his head with his finger, accompanied by a sword sound effect. This is very violent and must be removed. When he states the second rule in this list, that he can’t make anyone fall in love, his head turns into a huge pair of lips; he gives Aladdin a big kiss while saying some romantic dialogue. This rather silly bit of humor may remain, but his entire head may not turn into giant lips. He may, however, suddenly have a large pair of red lips, as long as his head is still present. When he states the third rule, that he can’t bring people back from the dead, he turns into a gnarly, slimy, green, corpse-like version of himself. This is disgusting and must be removed. 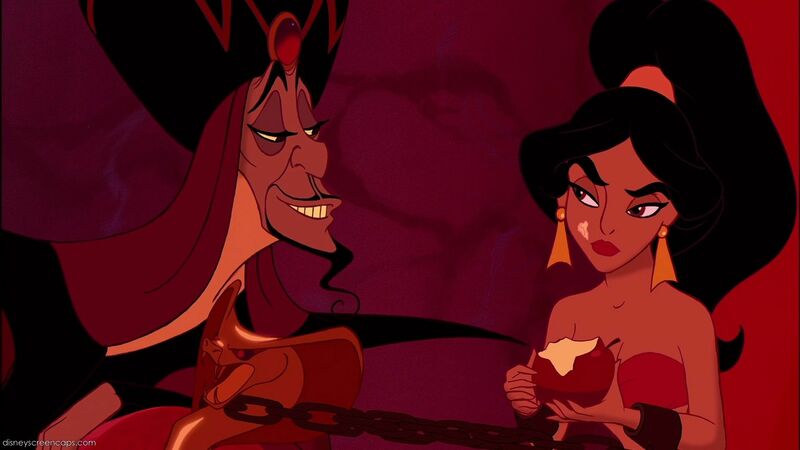 In a later scene, Iago proposes that Jafar marry Jasmine to become sultan. 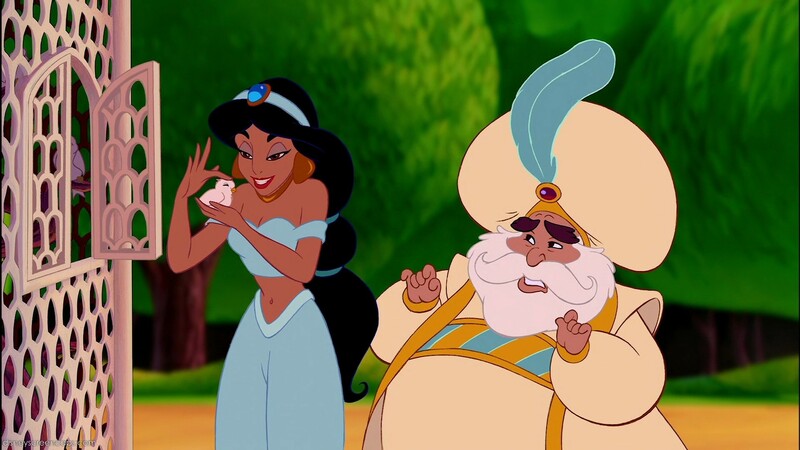 Then, he says, they’ll drop the sultan and Jasmine off a cliff. He demonstrates by falling headlong off of Jafar’s staff. When he hits the ground, he exclaims, “Kersplat!” The sound effect and the demonstration are unduly violent and unnecessary and should be removed. 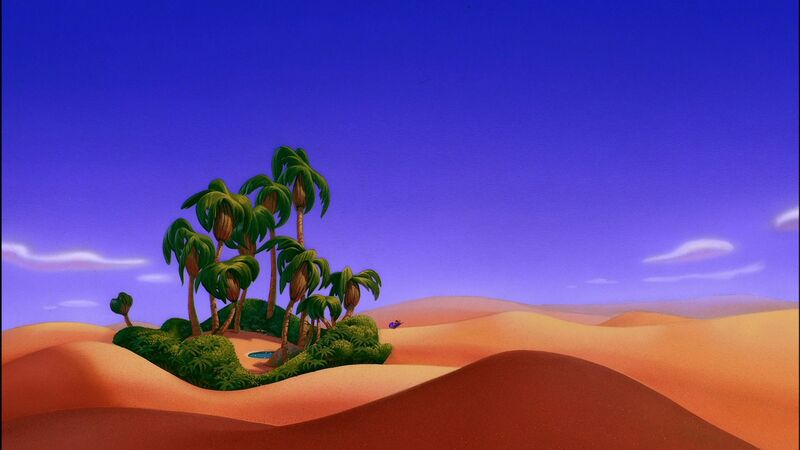 In the next scene, as Aladdin and Genie fly into a desert oasis on the magic carpet, the Genie, wearing a blonde wig and a stewardess outfit, does a silly stewardess skit. This skit is unacceptable and must be removed. 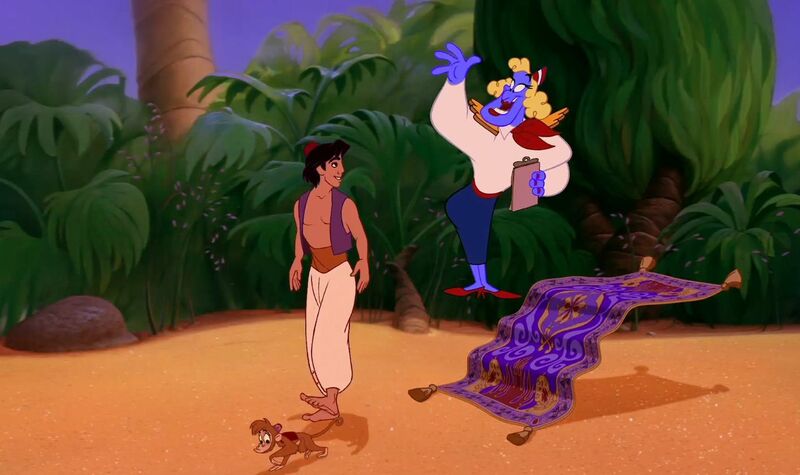 In the same scene, Genie begins the process of Aladdin’s first wish, to become a prince. 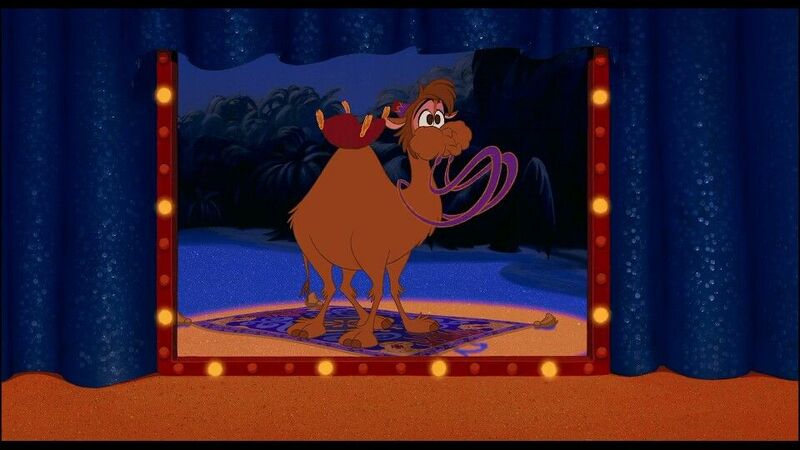 He turns Abu into a camel so that Aladdin will have a proper mode of transportation and says, “Careful, they spit.” After this, Abu promptly spits. This is vulgar and should be removed. 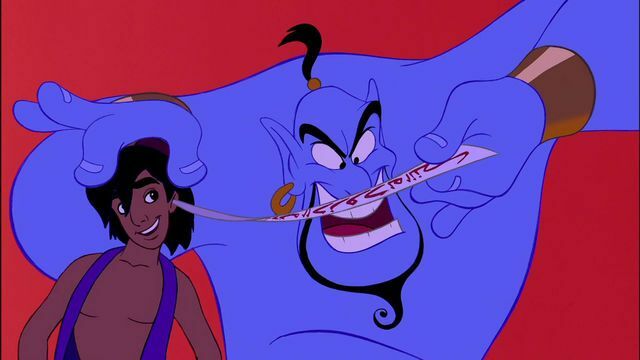 Later in the scene, as Genie continues transforming Aladdin into Prince Ali Ababwa, he exclaims, “Hold onto your turban!” This is a play on the forbidden expression, “Hold onto your hat,” and must be removed. 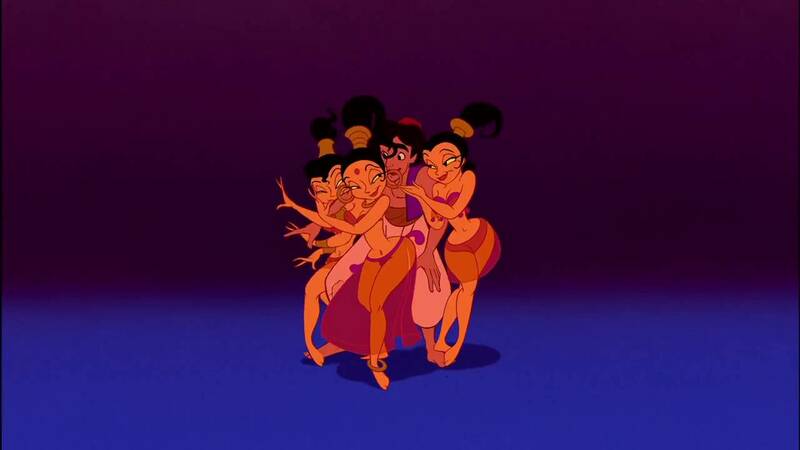 When the newly-created Prince Ali’s entourage enters Aggrabah in the song “Prince Ali,” it includes a few harem girls in scanty tops and transparent pants. Once again, they must be wearing adequate clothing. Later during the song, the three harem girls seen in “One Jump Ahead” appear on a balcony. 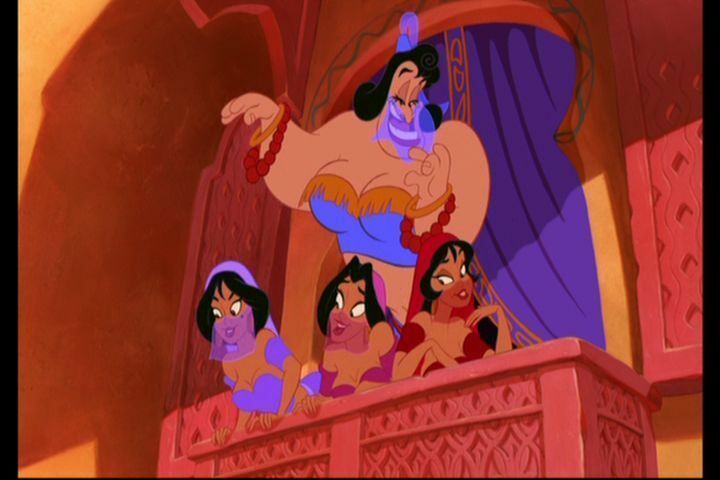 Then, Genie appears behind them, now dressed like a very large harem girl and sticking out of his top shamefully. This entire scenario is unacceptable and must be removed. 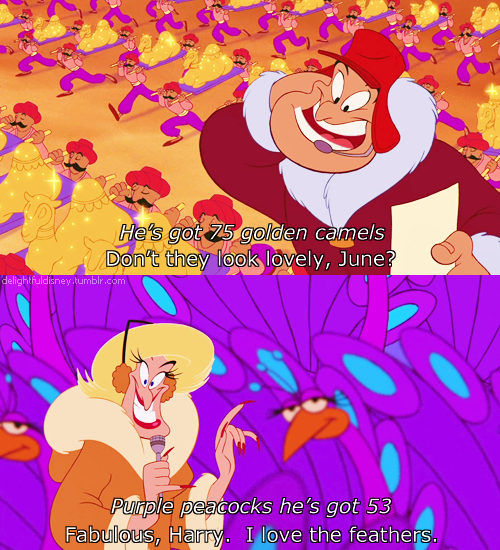 In this same song, as the entourage sings about Ali’s camels and peacocks, Genie pops up twice, dressed as two reporters, one male and one female. This joke may remain, but both reporters must be male. When Ali throws some gold coins to a group of people, they are all dressed properly except one woman, whose midriff is showing. Although her navel is not visible, this is once again unrealistic and potentially insulting. She must be wearing a full dress, like the other women. When Ali enters the palace, the sultan is fascinated by his carpet and exclaims, “By Allah, this is quite an ingenious device.” Once again, this is taking his god’s name in vain and must be changed. When the sultan takes a rather wild ride on the carpet, he flies in between the legs of Abu, who has been turned into an elephant. This is a bit vulgar and should be eliminated. 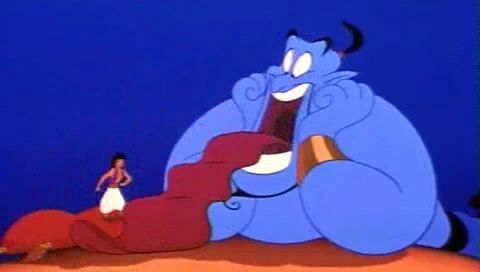 Later, after Genie saves Aladdin from being drowned by Jafar’s guards, Aladdin tells him how fond he is of him. 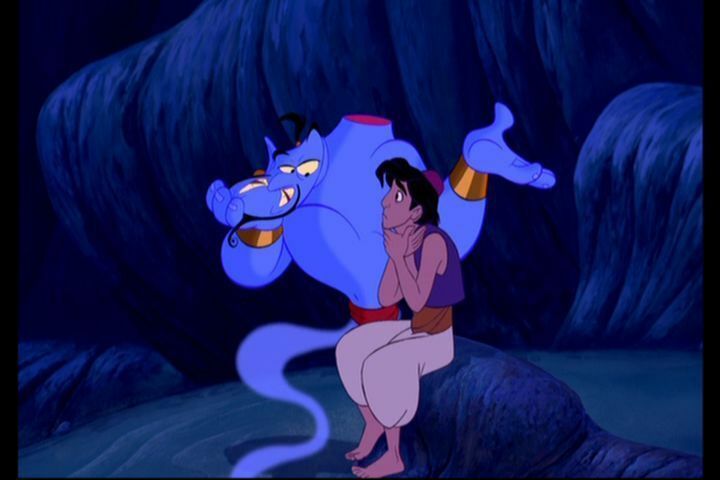 Genie replies, “I’m pretty fond of you, too, kid. Not that I want to pick out curtains or anything.” This last sentence is unacceptable and must be eliminated. 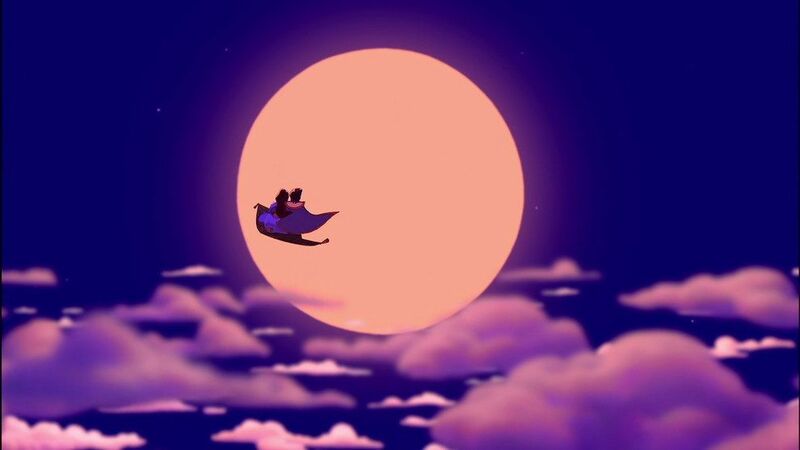 Later, when Genie and Aladdin have an argument, Genie disappears into the lamp. 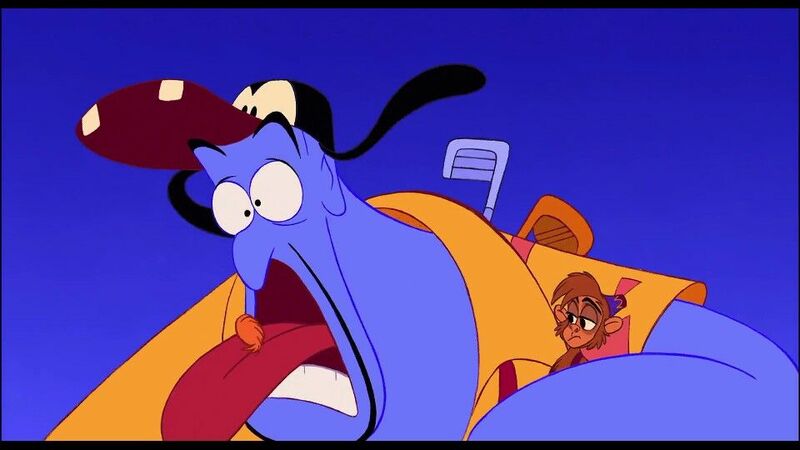 Aladdin tries to apologize, but Genie’s tongue sticks out of the lamp and does a raspberry. This is unacceptable and must be eliminated. 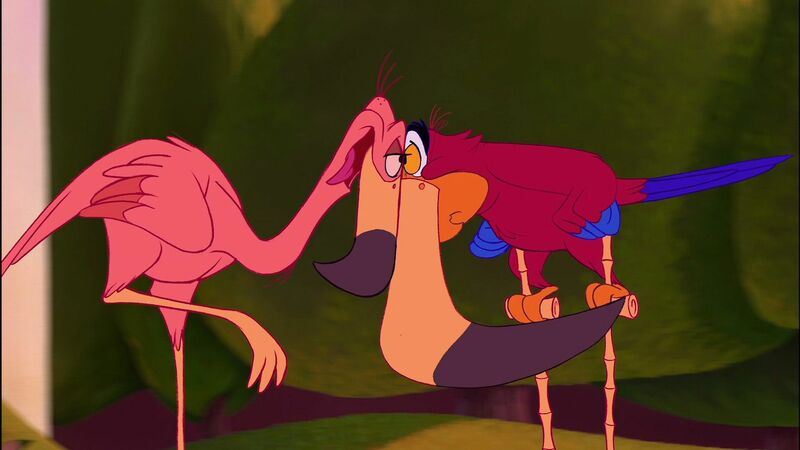 In the same scene, Iago disguises himself as a flamingo and does an imitation of Jasmine’s voice, asking Aladdin to come into the garden. Although he is merely walking on stilts and wearing a fake flamingo beak over his own, the flamingo next to him starts making eyes at him. This is unacceptable and must be removed. 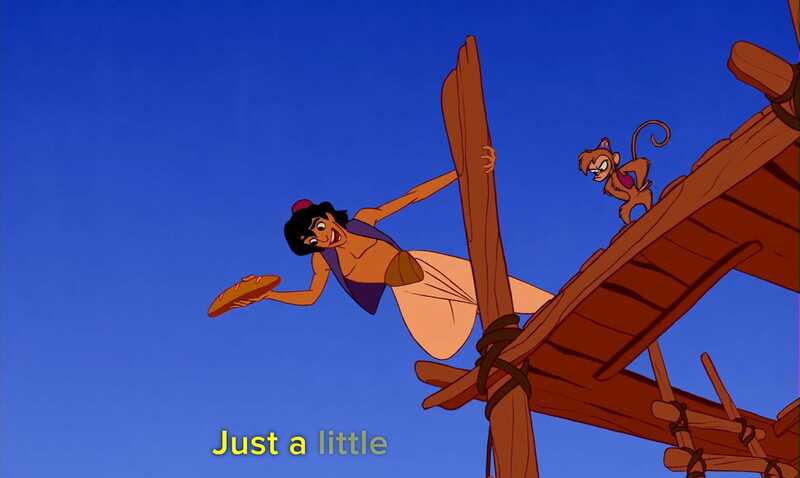 When Jafar, now possessing the lamp, has Genie turn him into a sultan, the real sultan’s clothes fly off of him and go to Jafar, leaving the gentleman in nothing but his blue-and-white striped shorts. This is far too little clothing, especially for a man of his age, and he must be wearing more than this. He must at least have on an undershirt, and his shorts should be looser. In the next scene, Jasmine is now dressed in a red belly-dancer outfit and has chains on her wrists. It is acceptable for her to be wearing this kind of outfit in this scene, to show that she has been degraded to little more than a common slave girl, but, once again, the outfit must be sufficiently decent. 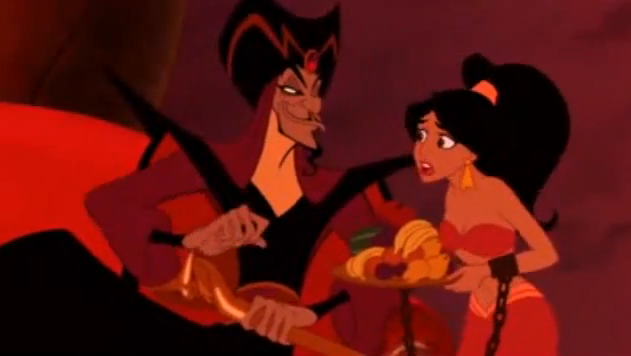 In this scene, Jafar takes a bite out of an apple in Jasmine’s hands. Then, as he speaks, he spits a bit of it onto her cheek. This is vulgar and must be eliminated. Later, when Aladdin is fighting Jafar, Genie turns into four female cheerleaders, chanting on Aladdin energetically, then only one cheerleader, cheering Jafar in a lackluster manner. If he must turn into cheerleaders, they should be male ones. When the happy ending is finally reached, Genie gathers everyone together for a group hug. He kisses Abu, then spits out some fur and says, “Oh, hairball.” This is vulgar and must be eliminated. I have now completed my breening of this film. As you have seen, it is positively riddled with problems at every turn. You can also see that none of them are core or deep-rooted elements which would make any change to the story if they were removed. It is very sad that, in a film which could have been entirely charming, enjoyable, and family-friendly, the filmmakers felt it was necessary to put in these silly elements. Why did Disney, practically every child’s favorite studio, have to go astray like this? In their early days, they made such beautiful, wholesome films. Then, in the Rating System Era, they started resorting to vulgarity, obscenity, and rude humor. We don’t need these elements in our movies or our culture, and both the latter and the former would be so much better without them. Once again, I hope I have not ruined this film for anyone or upset his childhood ideas about Disney in any way. I assure you that is not my intent. I merely wish to open people’s eyes to the problems in these films and the beauty of breening. Thank you very much for reading this. I’ll see you next time!